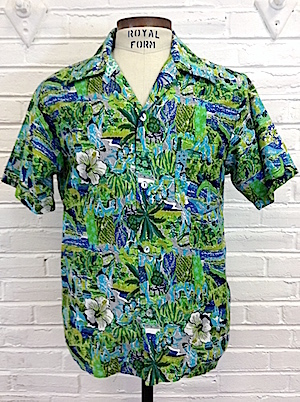 Home > Men's Vintage Shirts > Hawaiian Shirts > (M) Mens 60s/70s Hawaiian Shirt! Wild Green, Blue & White Tropical Landscape w/ Blue People! Mens vintage 1960s/1970s Hawaiian shirt! 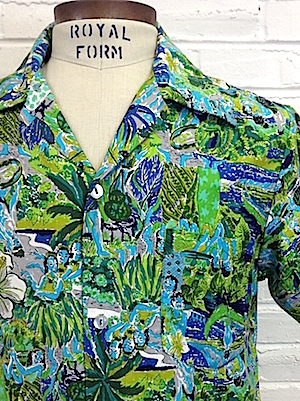 Amazing Hawaiian shirt features a crazy cool tropical landscape in shades of green, blue, white and black. Hidden within this busy pattern are various islanders with blue skin! Shirt appears to be from the 70s, but definitely has a 60s feel to the pattern. Pearly white buttons down the front with one square patch pocket on the chest. Straight hem with a nice, wide 70s collar. Tagged by Hukilau Fashions. 100% Cotton.